Want an exciting career in Travel and Tourism? Well now is your chance. 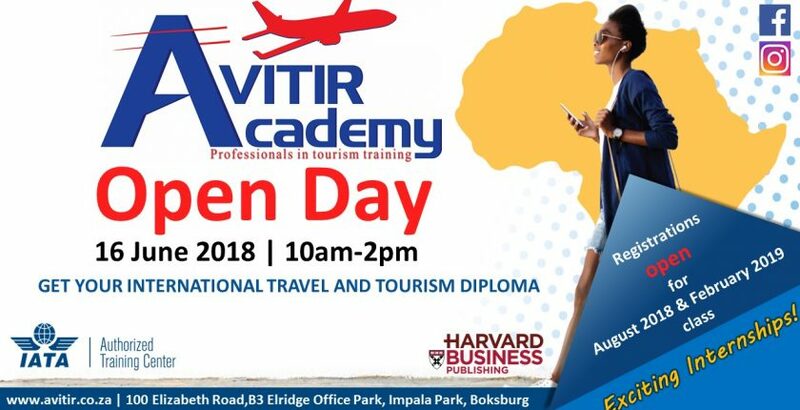 Join us this Youth Day (Saturday, 16 June 2018) at Avitir Academy for our open day, for all individuals interested in pursuing a career in the Travel and Tourism industry. This event presents an opportunity for learners and their parents or guardians to explore the range of study options available at Avitir Academy. Parents and learners can speak directly with our facilitators about their chosen fields, as well as register for either the August 2018 or February 2019 class.Guests may attend the Open Day any time between 10am-2pm. See you there!